In next March, three Foshan hydrogen-powered buses will first appear on a road in Kuching, capital city of Sarawak, Malaysia. Recently, Foshan Feichi Bus Co Ltd. (Feichi Bus) and Malaysia held a signing ceremony in Foshan (Yunfu) Industrial Transfer Park. According to the pilot project plan, Feichi Bus will provide 10 hydrogen fuel cell buses to Sarawak, helping Malaysian enterprises to create the first hydrogen bus project in Southeast Asia and realizing a breakthrough on the exportation of China hydrogen fuel cell automobile. The pilot project of hydrogen-energy development in Sarawak adopted the "3+3+4" purchase model, that is, they will purchase the first batch of three hydrogen fuel cell buses. Next, Sarawak Government will step up the construction of hydrogenation stations and upgrade the purchase of hydrogen fuel cell buses. At the signing ceremony, Chief Minister of Sarawak, Malaysia Datuk Patinggi Abang Johari Tun Openg said the hydrogen fuel cell city buses delivered by Feichi Bus would be in operation in Kuching in March next year. "The buses will be used as pilot projects in Sarawak to gradually improve the public transport systems and provide a better living environment for people." Datuk Patinggi Abang Johari Tun Openg said. 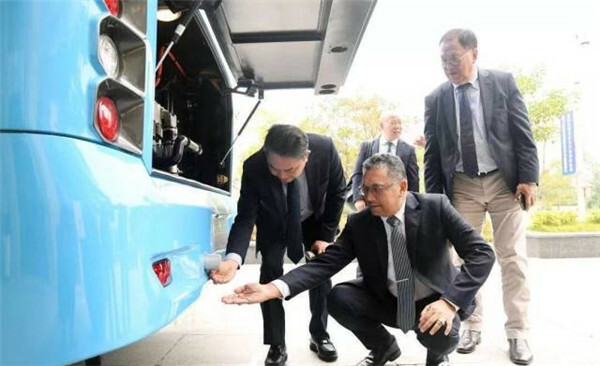 "As early as 2016, the hydrogen fuel cell bus developed by Feichi Bus was put into use in Foshan, Yunfu and other places, becoming the first batch of commercial hydrogen buses in China. For more than two years, the operational performance of the vehicles is stable and the technical application is mature, which is an important reason for Sarawak to choose to work with us ultimately." Jiang Yong, Chairman and managing director of Feichi Bus thought the partnership would be the beginning of Feichi Bus’s hydrogen-powered vehicles entering the Southeast Asian market.